Central American refugees often use trains to travel northwards through Mexico. Photo by Peter Haden. Migration has a deep history in Latin America. For many decades, millions have crossed borders into other Latin American countries, and especially into the United States, in search of a better economic prospects and freedom from violence, discrimination, and state oppression. In recent years however, migration has surged, and for many politicians it has become a hot-button issue. While these people have often been decried as mere “economic migrants”, it is important to recognise the true dimensions of this crisis, and people’s reasons for leaving their homes, families, and communities. While much of Latin America has long been defined by its insecurity, in Central America in particular, violence has exploded. The Northern Triangle has become the most dangerous place in the world outside of an active war zone, with the highest levels of homicide in the world. Ordinary citizens find themselves in the crossfire between government forces, paramilitary death squads, and violent street gangs. This insecurity has reached such a point that more people are now killed every year in El Salvador and Guatemala than during their civil wars. Faced with this extreme violence, hundreds of thousands of men, women, and children have fled their homes, and have taken the extremely dangerous journey northwards into Mexico and the United States. Exposed to the elements, and preyed upon by human traffickers, people smugglers, and gangs, many such journeys come to tragic ends. Still, there is often no refuge for those who reach their destinations – thousands are effectively imprisoned in detention centres, and risk being forced to return to certain death in their countries of origin. An image of the US-Mexican border. 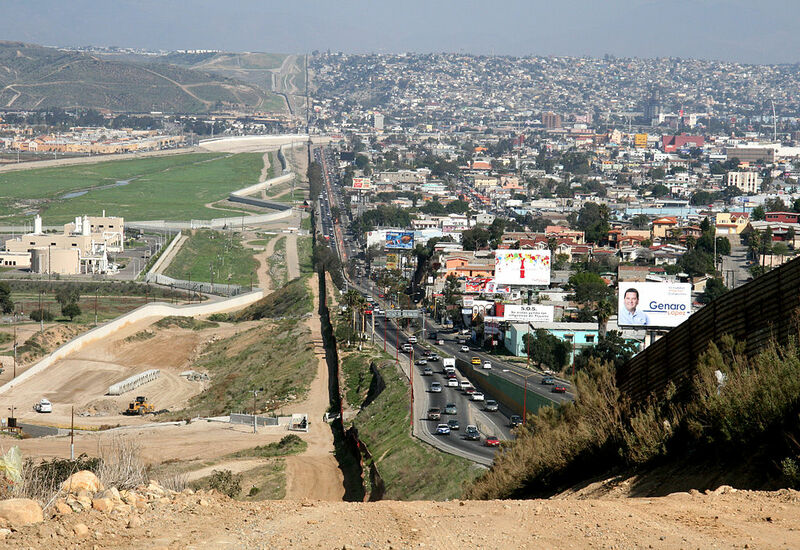 A corrugated iron fence separates Tijuana on the right from San Diego on the left. Given the parallels between this situation and Europe’s own refugee crisis, Latin America Week 2016 focused on the issue of migration. Set against a backdrop of popular indignation at how refugees were being treated in Europe, and a worrying increase in anti-migrant rhetoric in the United States, this was one of the most successful Latin America Weeks in our history. Speakers included representatives from migrant organisations in Ireland, a PhD candidate from Monterrey, on one of the major migration routes through Mexico, as well as Rebeca Cenalmor-Rejas, UNHCR Regional Protection Officer for Central America. As with every year, cultural exchange was a hugely important component in the celebrations, with Guatemalan Fernando López performing a series of songs drawing attention to issues of social justice in the Ixil community. Then as now, LASC encourages everyone to share, compare, and contrast our own experiences and views on migration with Latin American perspectives.